"What a wonderful way to use fresh raspberries... other than picking them straight off the shrub and into your mouth! I love to serve this light, fresh dessert with freshly whipped cream." Line an unpricked pastry shell with a double thickness of heavy-duty aluminum foil. Bake the pastry shell in the preheated oven for 8 minutes. Remove foil; bake 5 minutes longer. Cool on a wire rack. Place the sugar, cornstarch, and water in a saucepan. Cook over medium heat until the sugar and cornstarch dissolve and the mixture thickens, about 10 minutes. Remove from heat and whisk in the raspberry flavored gelatin mix. Refrigerate the filling until slightly cooled, about 15 minutes. Arrange the raspberries evenly in the bottom of the prepared pie crust. Pour the raspberry gelatin mixture over the berries. Chill the pie in the refrigerator until set, 4 to 6 hours. Garnish with whipped cream to serve. I made this pie based on the good reviews, but I was very disappointed. The pie tasted like dried out gelatin. I was sorry I wasted my fresh raspberries from my garden. My family loved this pie! I just used a premade graham cracker crust to make it extra easy. Very delicious! this pie is simply wonderful!! my family requests it for every holiday and event! thanks for sharing! I entered it in a baking contest at my Parks & Recreation and won a Silver Medal with it. Yum! i loved this recipe! super easy! 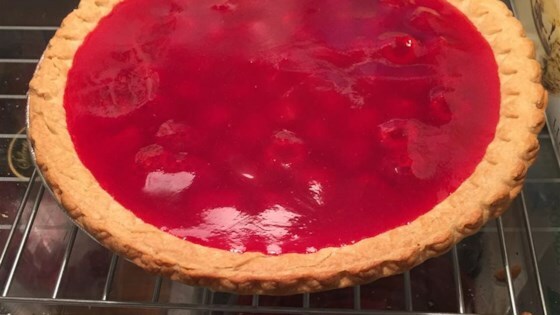 the first time i made this pie, i didnt have raspberry gelatin so i used cherry. the cherry seemed to help counteract the tartness of the raspberries. I wish the gel had more flavor, it was just super sweet and you couldn't taste the raspberry. Maybe less sugar would help with this.